Assigned the Heritage, Planning and Urban Design portfolio (with Tricia Reade) at the beginning of the Waitemata Local Board term, the challenges within the portfolio were exemplified by one larger than life situation. For years, large advertising bill boards had been put on the St James façade, facing Queen St. Noticing that it did not have a registration number (which all billboards need), and armed with a complaint from a constituent, I asked officers if the billboard was legal. It wasn’t. I asked for it to be removed. The reason was quite simple. If the building owner was engaging in an activity that was not in conformity to the bylaw, then I, as elected representative, faced the prospect of a different building owner deciding to do exactly the same thing along Queen Street. We faced a proliferation of large façade billboards. Morally the situation was clear; either the billboard would have to be removed, or alternatively the bylaw would need to be amended to ensure equality for all building owners. I did explain to the officers that I was concerned about the St James heritage values, particularly in respect of the physical structure. Knowing how expensive it can be to repair, restore or maintain a heritage building, and knowing that the St James had suffered a fire leading to its closure, I suggested to officers a political compromise – the building owner could keep the billboard for the interim, only if it could be proved that the revenue from the billboard during the time that the billboard was in place was being spent on repairing and restoring the St James. Evidence would need to be cold hard physical invoices, and contactable trades people to confirm works done. 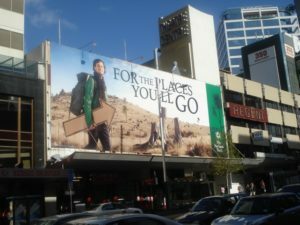 The billboard was removed several months later. The effect has been to reveal more of the St James façade, and to restore it’s presence on Queen Street, acting as an additional spur to literally hundreds of people fighting for its restoration.